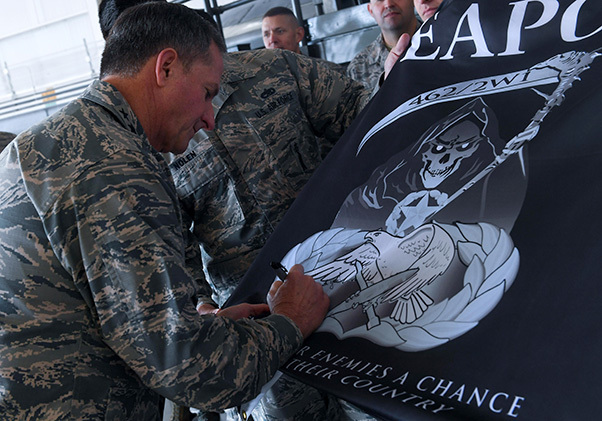 Air Force Chief of Staff Gen. David L. Goldfein signs the Barksdale Air Force Base Weapons flag at the Weapons Load Training hangar at Barksdale AFB, La., Oct. 17, 2017. 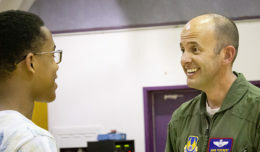 Goldfein met with Airmen throughout the day to discuss the nuclear mission and the role they perform to execute it. Air Force Chief of Staff Gen. David L. Goldfein discussed the important role Barksdale Air Force Base Airmen perform in executing the nuclear deterrence and assurance mission during an all-call at the Weapons Load Training hangar, Oct. 17, 2017, at Barksdale Air Force Base, La. 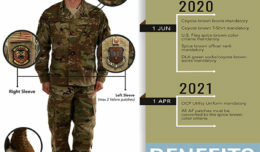 The general explained that to understand and prepare for the future and the continuing evolution of warfare, Airmen must think globally across six domains. “We’ve got to think about future conflict as multi-domain, and that’s not necessarily one domain supporting another – that’s all domains operating simultaneously. Think about how we sense the globe. I offer that we sense the globe in six domains – air, land, sea, space, cyber and undersea,” he said. Answering a question from an audience member, Goldfein explained how Airmen can successfully lead the Air Force into the future. During his visit, Goldfein met with the Airmen responsible for weapons and munitions as well as the B-52 Stratofortress aircrews who help keep the bomber fully operational and deployable 24/7. The 2nd Bomb Wing, under command of 8th Air Force and Air Force Global Strike Command, all located at Barksdale AFB, provides support for one leg of the nuclear triad by maintaining the B-52, a long-range bomber capable of delivering nuclear and conventional ordnance worldwide.